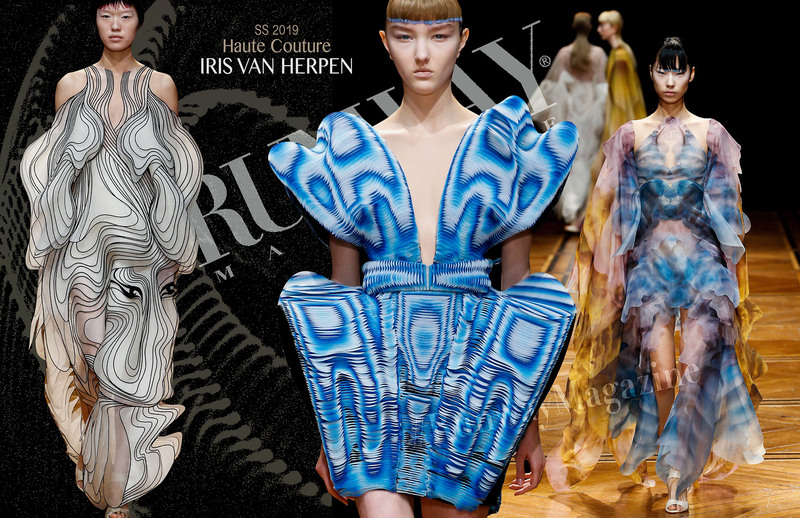 Iris Van Herpen Haute Couture Spring Summer 2019. Iris van Herpen is a Dutch fashion designer who is widely recognized fashion, who continuously pushes the boundaries of fashion design. Since her first show in 2007 van Herpen has been preoccupied with inventing new forms and methods of sartorial expression by combining the most traditional and the most radical materials and garment construction methods into her unique aesthetic vision. Van Herpen is utilizing 3D printing as a garment construction technique, and as an innovator who is comfortable with using technology as one of the guiding principles in her work because of its sculptural nature and unfamiliar form. The designer’s intent is to blend the past and the future into a distinct version of the present by fusing technology and traditional Couture craftsmanship. 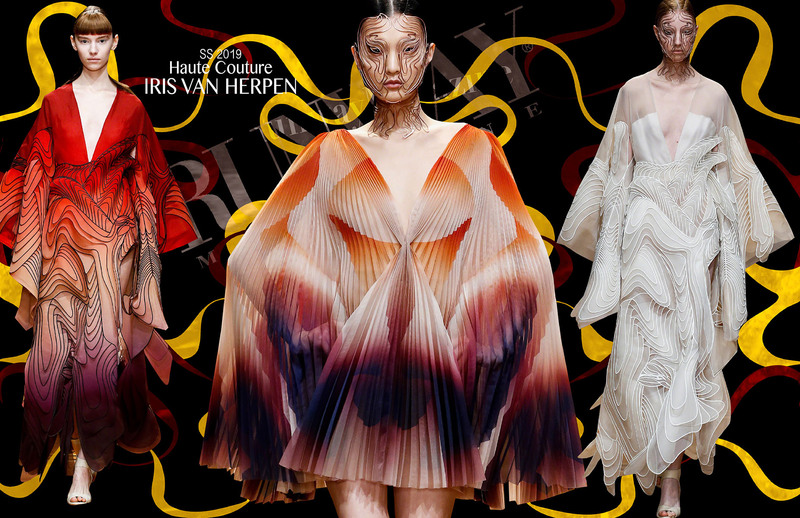 Collection of Iris Van Herpen Spring Summer 2019 is another story of femininity and the female form to visualize the invisible. Within my search for transformation, one of the most influential things for Iris Van Herpen has been classical ballet practice. Those years of dancing gave to her an understanding of the symbiotic relationship between the mind and body, the transformation of movement, the “evolution” of shape. “I am seduced and obsessed by the behavior and the misbehavior between the body and her architecture, her shelter. It’s the interaction between the two that fascinates me, that challenges me to think beyond todays definitions of a garment, ” – she said. 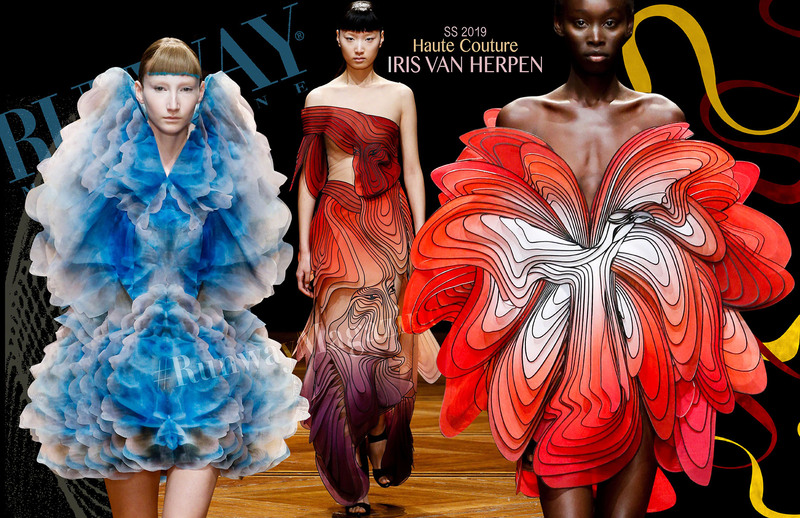 Each collection of Iris Van Herpen is a search to reach beyond usual understanding of physical reality, to the power to communicate with people on a deeper level, an unconscious level, like sound or smell can do. The endless mysteries within nature create a huge influence on work of the designer, through biomimicry she strives to find the forces behind the forms in nature. She constantly looks at the hidden beauty at the intersection of precision and chaos, art and science, the artificial and the organic, that are blending into infinite hybrids. This philosophy of duality, this ying and yang is core to everything she makes. “My creative process is experiment, exploring new forms of femininity, finding new forms of craftsmanship to transform traditional Couture towards new grounds of innovation. 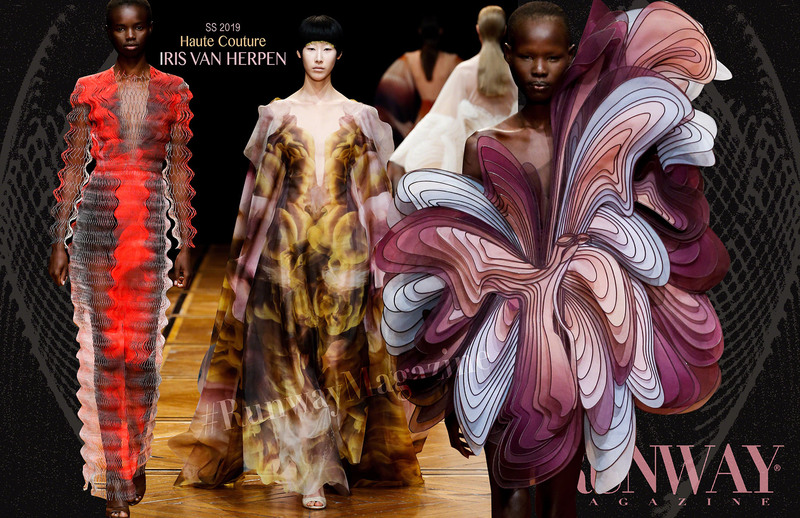 I don’t draw, I only drape, so my process is very intuitive.,” – said Iris Van Herpen.